It’s been nothing like a smooth ride for Keolis Commuter Services, which has just replaced the Massachusetts Bay Commuter Railroad Co. as the operator of local public transit systems. 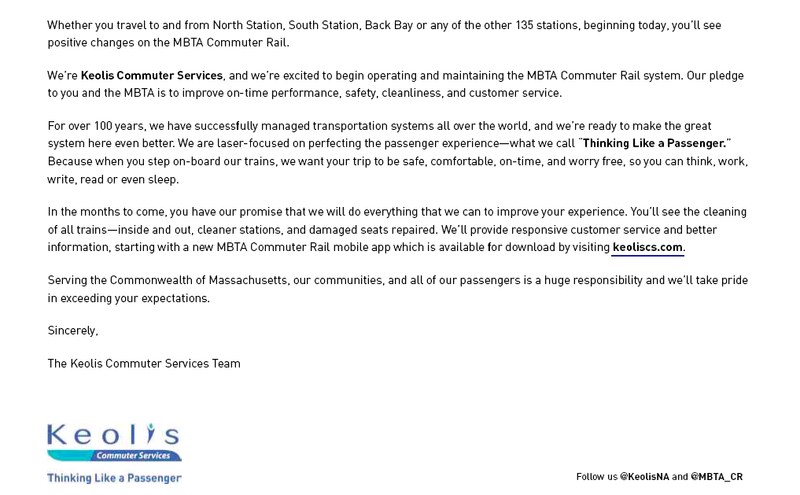 Keolis pretty much said, Yeah – promote this. It was not the debut Keolis Commuter Services officials had hoped for: Early Tuesday, a commercial truck hauling thousands of pounds of seafood crashed into a Westwood railroad overpass, starting a fire and shuttering both directions of morning service on the Franklin commuter rail line for two hours. Yet MBTA General Manager Beverly A. Scott took an optimistic tone at a Tuesday morning press conference on Keolis’s first day running the commuter rail system. Uh-huh. Other than that, Ms. Scott, how was the play? Back to Keolis and its tagline Thinking Like a Passenger. The hardguessing staff believes passengers are thinking, Huh? This entry was posted in Uncategorized and tagged Adrian Walker, Beverly Scott, Boston Globe, Bruce Wall, Eugene Rivers, Keolis Commuter Services, Massachusetts Bay Commuter Railroad Co., MBTA General Manager, Whiskey Tango Foxtrot. Bookmark the permalink.